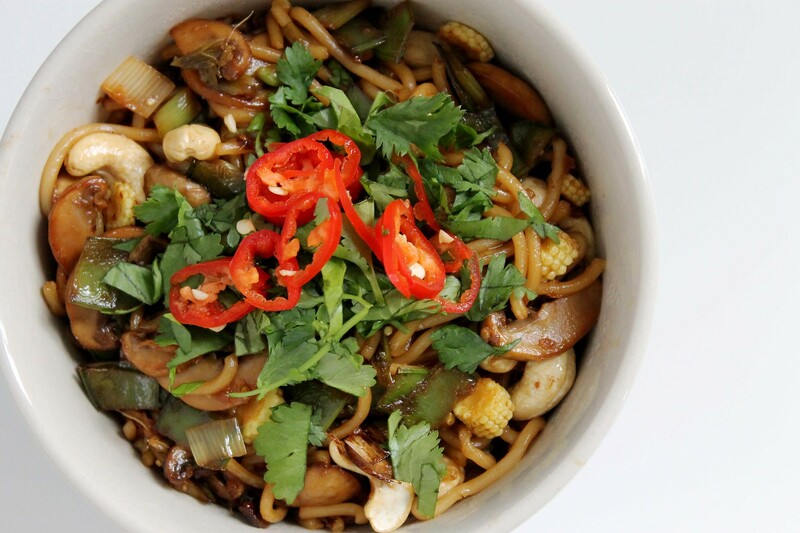 It’s so easy on a Friday night to hit the takeaway when you’re feeling a bit wrecked at the end of a busy week but this recipe for quick cashew noodles might help to save you from yourself! It feels like everyone is caught for time these days and personally at least I find that my healthy eating habits are the first to go when I’m feeling under pressure. Beans on toast feature way too frequently and cereal for dinner (so hipster!) is not really a nutritious meal! With some very basic ingredients it’s possible to have a tasty nutritious meal on the table in less than 15 minutes. The toasted cashews give the dish a hit of protein but you could substitute these for another protein source you’d prefer. This is a handy dish for using up the sad wilted veggies left over at the end of the week too. I’ve used mange tout and baby corn here but peppers, bok choi, chinese leaf, broccoli, carrot etc could be used. I also used straight to wok noodles for the ultimate lazy dish but you can use any kind you have. Medium thickness are best in this dish so they don’t fall apart. Prep your noodles first, for me that meant opening the packet, but pop them in a pot of boiling water if you’re using dried ones. Prep your veg, clean and slice the mushrooms, dice the spring onions, baby corn and mangetout and keep everything close by your wok. You’ll cook this on a high heat so prep is key to prevent your veg from burning! Place your wok over a medium to high heat. Toast the cashews in the dry wok for 10-15 seconds and then set aside. Add the sesame oil to the wok. When it’s nice and hot, use a microplane or garlic press for the ginger and garlic. Keep them moving in the oil until they start to brown. Add the spring onions, baby corn and mangetout and toss for 30 seconds or so. Add the mushrooms. Once the mushrooms are nicely cooked down add the tamari (or soy sauce), the maple syrup and the lime juice. Add the toasted cashews. 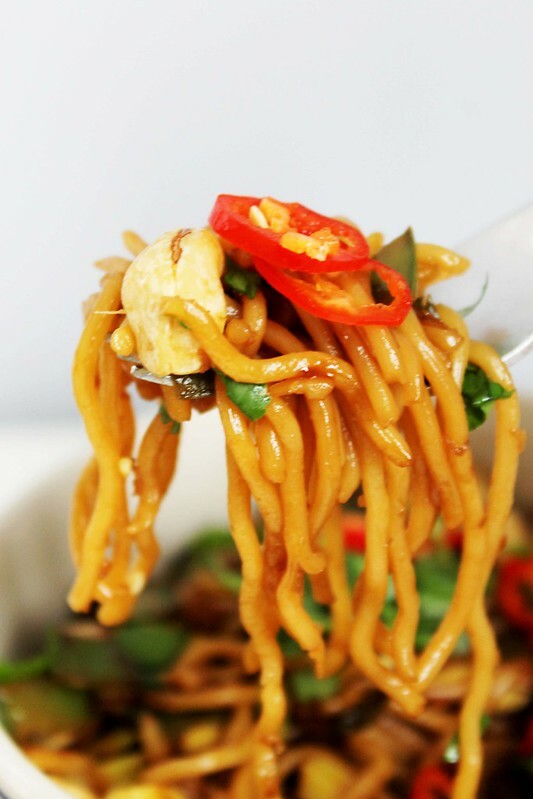 Place your noodles in the wok and toss everything together for a couple of minutes until the noodles are nicely coated with the sauce. 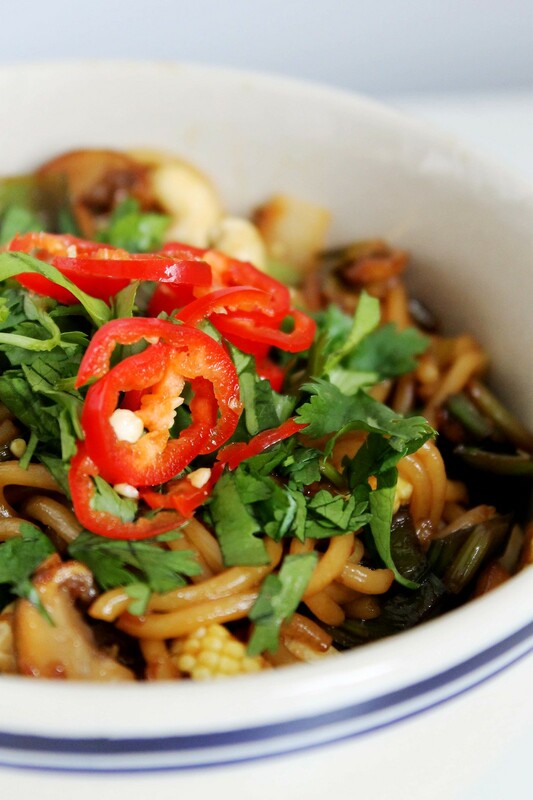 Serve in bowls topped with sliced chilli and chopped coriander. Use chopsticks if you’re a properly rounded adult, or a fork if like me you still can’t manage them.